UC-Berkeley is trying to pay for its new $400 million football stadium by selling PSLs. It’s not going well. Now that the NFL is banning all but small clear plastic bags, the Philadelphia Eagles are giving fans free bags that meet the new standard. But only for season ticket holders — everyone else can buy their own damn bags. Travis Waldron at ThinkProgress has a good overview of how students and taxpayers are subsidizing college athletics to the tune of $2 billion a year, and he doesn’t even get into stadium subsidies for public universities. The Cleveland Browns could now be looking for $200 million in upgrades to their stadium. Still no word on who’d pay for it. Brazil’s frenzy of World Cup spending is partly FIFA’s fault for suckering them into it, writes Jonathan Mahler. Sacramento is set to spend the first $6.5 million on financial, design, and legal consultants for its new Kings arena. Much, much more to come. Philadelphia Eagles owner Jeffrey Lurie announced details of a planned $125 million upgrade of Lincoln Financial Field yesterday, with most of the money allocated for tech enhancements (including a stadium-wide WiFi network, as NFL teams continue to try to push for fans to bring tablets to games to recreate the sitting-at-home-in-front-of-the-TV experience) and, based on the renderings, longer video boards. Lurie also says he plans to pay for the upgrades, which will be completed over the next two offseasons, with his own money. The NFL approved league G-4 stadium funding yesterday for the Atlanta Falcons, Carolina Panthers, and Philadelphia Eagles, as part of the expected shares of new or renovated stadiums that — whoa, wait, the Eagles? What are the Eagles doing on that list? 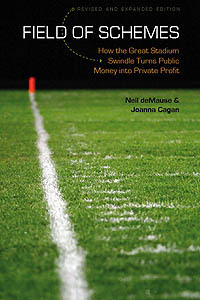 And not just with fans, one hopes, but with Philadelphia legislators as well, since one of the conditions of the G-4 program language is that any funded projects must be “public-private partnerships.” So the only way this is going to work is if the Eagles seek some public money for upgrades to 10-year-old Lincoln Financial Field. If those cost $60 million to $100 million as previously projected, then we’re talking about $30 million to $50 million in public money. It’s the sort of thing you’d hope that any of the numerous articles about the renovation plan would have mentioned, but I guess it’s a lot to expect today’s newspaper journalists to think outside the press release.